The world’s top CEO’s and business leaders agree, Driving Loyalty is must-reading for every manager, entrepreneur, corporate executive and anyone looking to increase customer satisfaction, boost employee engagement and significantly enhance the bottom line. Driving Loyalty is based on a company and leadership that truly walks the talk on how to build people capability, culture, and brands the right way. There’s no way you can read this book without taking away some great ideas and concepts that will help you grow yourself and your business. Enterprise is one of the truly great service companies. In Driving Loyalty, you’ll learn how its synthesis of outstanding leadership, unique management systems, and innovative marketing have led to fantastic success. Driving Loyalty provides an excellent roadmap for how to succeed in building your brand, motivating your team, and delighting your customers regardless of the underlying economy. The author’s credentials are substantial; he is the author of 24 previous books, a national speaker, and a marketing head for a financial services institution. His subject here is an important one. After all, what’s a business without customers? 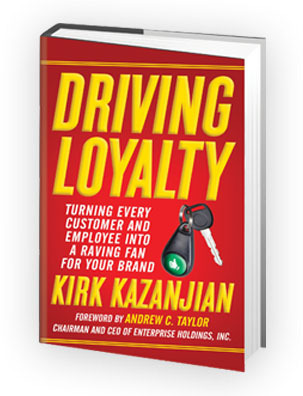 His book is an overview of the factors that create customer loyalty: dedicated employees, strong brand identification, service without question, marketing, smart business decisions (such as those around mergers and acquisitions), and technology. © 2019 by Kirk Kazanjian. All rights reserved.